A hacker who spent time in prison -- some say unfairly -- is threatening to exact revenge by exposing federal prosecutors around the country who he claims had accounts on the dating site Ashley Madison. Ashley Madison, a dating site for married people who want to cheat, was recently hacked. Anyone smart enough to find the files could search through its users. Some people signed up using their government email accounts. Some of those included police chiefs, government bureaucrats -- and federal prosecutors. And that's where Andrew Auernheimer comes in. Auernheimer is notorious in the hacking world. Back in 2010, Auernheimer discovered that AT&T was inadvertently exposing iPad users' personal information online. He went public with that information. As a result, he got arrested and was sentenced to three and a half years in a federal prison for violating the Computer Fraud and Abuse Act. Civil rights lawyers joined his cause and won a court appeal after Auernheimer had spent years in prison. 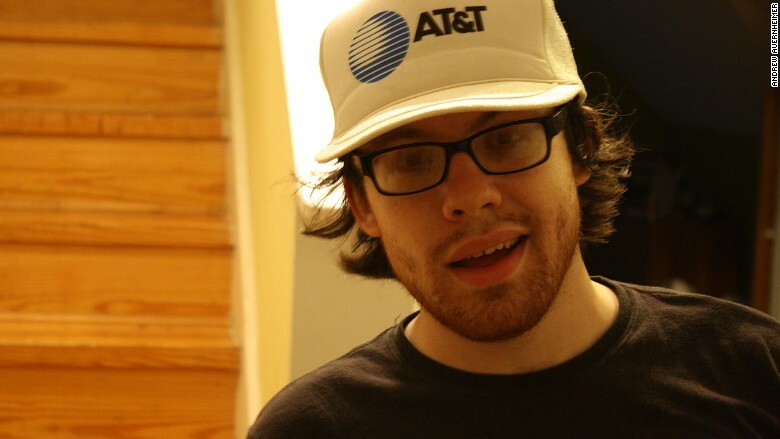 He became a cause célèbre for hackers and Internet freedom. Angry and bitter -- and trying to stay as far away from American law enforcement as possible -- Auernheimer has roamed the Middle East and Eastern Europe since then, getting by on supporters' donations in the digital currency Bitcoin. On Thursday, Auernheimer wrote an email to two federal prosecutors in New Jersey whose office put him behind bars. CNNMoney was copied on that message. "You have yet to apologize and make amends," Auernheimer wrote. He then criticized the prosecutors for so aggressively targeting hackers and protesters. 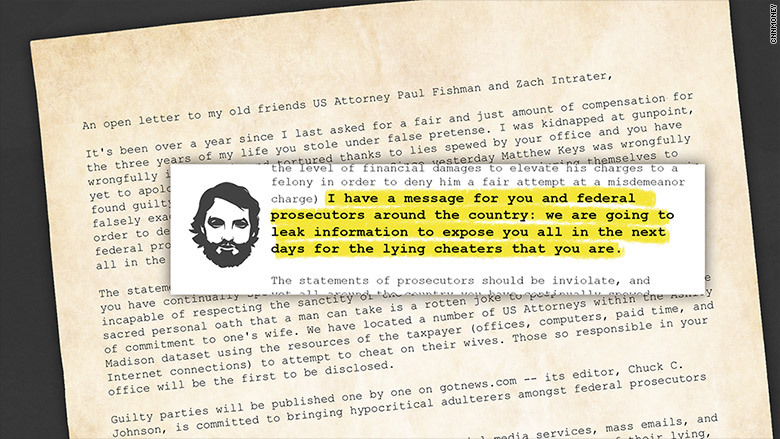 "I have a message for you and federal prosecutors around the country: We are going to leak information to expose you all in the next days for the lying cheaters that you are," Auernheimer wrote. To find the names, Auernheimer looked through the exposed Ashley Madison database, which is now public. Auernheimer said he plans to expose two federal prosecutors in New Jersey -- and one in every other office around the country in the coming weeks. Auernheimer said the information will be posted Thursday on an alternative, anti-establishment news website, GotNews.com. The U.S. Attorney's Office in New Jersey declined to comment, but officials said they were aware of the situation. It's unclear if his actions violate any laws. He's not trying to extort them, the information is public and having an Ashley Madison account is legal. CNNMoney spoke to Auernheimer and asked why he's still angry. Here's how he described his life. "I used to make six figures," he said. "Then I was kidnapped from my childhood home of Fayetteville, Arkansas, at gunpoint. My home was bulldozed. Three years of my life was stolen under false pretense. I was subject to beatings, false imprisonment, and extensive periods in solitary confinement, the latter of which is proven extensively in medical literature to cause permanent neurological damage. And now I am a destitute refugee with no home." "It will lessen their lives," he responded. "Federal prosecutors and their homes should be targets in every sense of the word. They are criminal slime, and they should receive every bit of damage back to them that they do to society."